If you read our recent article about 5S/Lean, or if you are starting a 5S initiative at your workplace, you may be ready to check out some tools for 5S success. Whether it's organizing or cleaning, or even just some good advice, Q Source offers the best tools to fit your 5S needs. Sort – Sort through everything in the work area and eliminate all unnecessary items. Store or throw away everything else. Set In Order – The goal here is to organize the workspace. Arrange, straighten, label, and work toward an efficient work area. Shine – Sweep, clean, and tidy up the work area to promote a clean, efficient, and safe workspace. 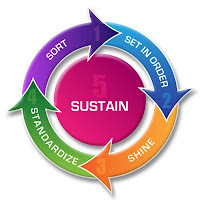 Standardize – An ongoing successful 5S initiative needs the consistency created by standardization. Sustain – 5S is only a success if the efforts of the first four steps are continued on a regular basis. QSource.com's solution-providing Web site offers the tools you need to make each step of the 5S process easier and successful. Proper labeling of products, storage areas, procedures, and floors is an integral part of 5S and we have a variety of label printers, labels, signs, and tapes to help make the process easier. Our printer offerings include thermal transfer printers, portable printers, and even an entire store dedicated to the Brady BMP 71 Printer. Of course, you'll also find all the ribbons and accessories you'll need to go along with your printer. To make your visual workplace easy to navigate you need the right labels, signs, and floor tapes. 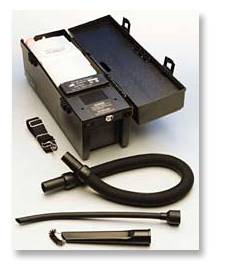 QSource.com's choices are far-reaching and include: dot matrix, ink jet, thermal transfer, and write-on labels. 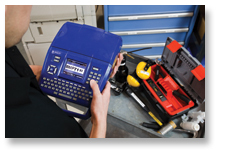 Our safety-related labels and signs also include a selection of ESD-safe labels. Our floor tapes and striping choices feature a variety of colors and sizes. We've previously written about the Akro-Mils Indicator Bin, which is a really cool and inexpensive way to create a visual inventory control system. In addition, we have a wide selection of totes, trays, and bins of all sizes, shapes, and colors—you're sure to find the right bin for the job. If bins won't do the trick, or you need to ship unneeded items from your workplace, check out our selection of corrugated boxes available in many shapes and sizes. And when you need a place to put your bins and boxes we have many shelving and storage options. The third step in the 5S process, calls for a clean, safe work area. Our cleaning supplies section contains many tools to help you create a tidy, spotless workplace. A selection of industrial and ESD-safe garments also promote worker cleanliness and safety. Further enhancing work-area safety are our safety information choices and a selection of industrial and task lighting products. That's our look at some of the best tools for 5S/Lean success. It's, by far, not an all-inclusive list, but, as always, if you can't find what you need please call (800-966-6020) or contact us through our Web page and we'll help you find a solution. Good luck in your Lean endeavors. If you would like to recommend other useful 5S/Lean tools, or are just starting out and have questions about 5S/Lean, we'd love to hear from you in our comments section.